Cardinal Pell of Australia and former Vatican treasurer was found guilty by a jury. He was accused of sexually molesting two choir boys in 1996 at Melbourne's cathedral. The cardinal pleaded not guilty and has reaffirmed his innocence even after the guilty verdict. He will be appealing the decision. The cardinal was charged with 5 counts of sexual abuse of a minor; one charge for the penetration of a minor under 16 and four counts of an indecent act on a minor younger than 16. According to the details of the case, two 13-year-old boys were caught drinking wine used for Communion. The cardinal caught them and told them they are in trouble for drinking it. Afterwards, Pell forced the boys into indecent acts, including penetrating one of them. One of the victims testified before the court. The other victim died of a drug overdose in 2014. Some claim that he succumbed to drug use due to the abuse allegedly perpetuated by Pell. The news of this verdict has been circulating since December. However, the media was not supposed to report on the court decision until the judge gave the clear. Journalists to revealed the details of the trial without the court's approval may face jail-time themselves. 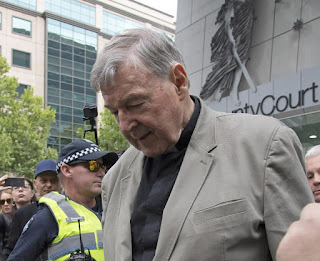 On his part, Cardinal Pell voluntarily left Rome to face the charges. As a cardinal, he has Vatican citizenship and diplomatic immunity. The cardinal believed he would be cleared of the charges and has been adamant about being innocent. He took the risk and is now facing prison time. The Vatican said the decision is painful but that Pell has a right to defend himself to the last degree. This whole situation is indeed sad and painful. I will not say that the cardinal is innocent or guilty for I simply do not know. Many things have to take into account. Australia is very hostile towards religion. It is possible that the jurors chosen made their decision based on personal convictions and not the facts. Moreover, not much evidence was provided to corroborate the claims. Only testimonies were used. In my opinion, the case should be retried in another venue with more substantial evidence. This is not to say that the victims lie. I state this for the sake of fairness for both parties. If testimonies are the sole thing that suffices to convict someone, then the legal system is in trouble.